Are you struggling to determine whether or not your teenager may be abusing drugs? If so, know that you are not alone. Unfortunately the number of teens abusing drugs is on the rise and it’s more important than ever for parents to be extremely proactive when it comes to spotting common signs of drug abuse. At The Forrester Center, we offer addiction counseling catered towards young people and are always here if you need assistance traversing this complex epidemic. Read more about Benefits of Substance Abuse Counseling for Adolescents in Spartanburg County. Below are just a few of the tell-tale signs that your child may be abusing drugs and a parent’s guide to help your kids recover from drug addiction. If you start to see any of these signs it’s important to think about next steps as it relates to your child’s drug abuse problem. How to Approach Your Child About Suspected Drug Abuse? While it can be both difficult and awkward to confront your teen about suspected drug abuse, it’s vitally important that your loved one gets help if they are struggling with a drug problem. It can be often difficult for parents to separate hormonal teen behaviors from signs of drug abuse. If you’ve noticed a number of the signs we’ve listed above and they seem to be suddenly exaggerated compared to past behavior, it may be time to intervene. The first step in determining if you’re truly dealing with a drug problem is to begin to start a conversation with your child about the suspected drug use. Be sure to ask understanding and compassionate questions to help your child feel more comfortable about talking to you about any struggles that they may have. Studies have shown that teens who feel more supported at home are more likely to stop experimenting or seek help if they’ve developed a drug addiction, so it’s incredibly important to remain compassionate even if your child admits that they’ve been using drugs. 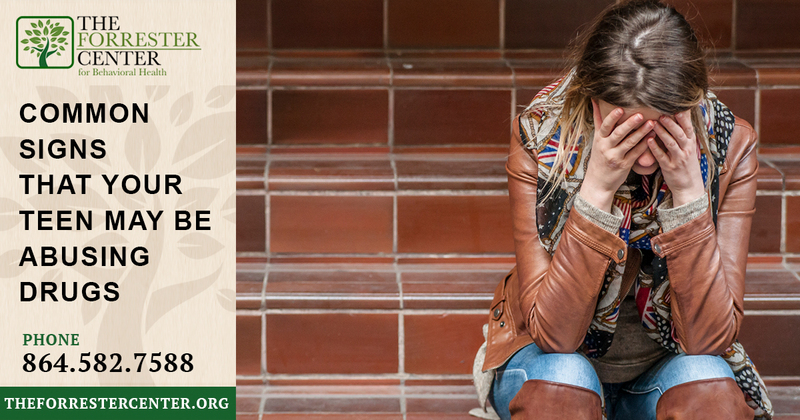 If you’re convinced that your child is abusing drugs and needs treatment, The Forester Center is here for you. We’re a nationally credentialed facility with an entire Adolescent Services Department focused solely of meeting the needs of teens in Spartanburg County. To learn more about our Adolescent Outpatient & Intensive Outpatient Services, reach out to one of our drug abuse counselors today at 864-582-7588.